I attended my very first little face-to-face meeting of bloggers today! Some of us local bloggers have wanted to get together for a while now but we recently had a couple of out of province bloggers in town which gave us the perfect reason to convene. Pictured from left to right are: Anna from Working On It, Marin from Planning Doesn't Work, Me and Ruby, Emily from Wish, Wait, Hope, Pray (and various other locations around the internet) and Emily from IF This Works (whom I've met previously and was my cycle buddy when Ruby was being... created - and has since become a friend). After brunch we strolled around in the FREEZING RAIN/SNOW and did a little shopping. I really enjoyed seeing/meeting everyone and am hoping we can have these little get-togethers more often. You all look BEAUTIFUL, btw. How wonderful!!! I'm a bit jealous though. I had a great time! We need to get together more often. Back atcha honey - was a great time and so lovely to meet you all! I agree that you, Emily and I should make it a regular thing! Oh how fun! Bloggers in real life rock. It was so awesome! I'm still sort of coming down from it all. I was saying later that everyone was so much like how I imagined them from reading their blogs - goes to show that we really are honest in our online lives! That's so cool. 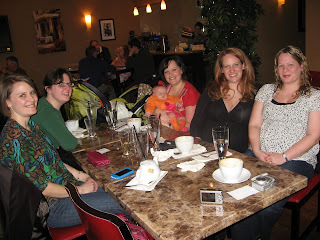 I would love to get together with my favorite bloggers - but they're all over the staes...and canada...and australia.